I am back again with yet another acne skin care review. As you all know, I have been having acne and blemishes almost all year long but it has been calm especially over the later half of the year. This is not to say that the acne days are completely over (i so wish it was) but those days are more under control and i am loving it. For many people who have acne, the main concern is to get rid of the acne and prevent new one from rearing their ugly faces and at the same time fade away any blemishes/scarring/spots the acne have left behind on your face as a memento of their dark presence.. :-((. I have tried many products and i have shared a few here and i am happy to say many of the ones made from natural ingredients work best for both preventing acne and fading away the dark spots. 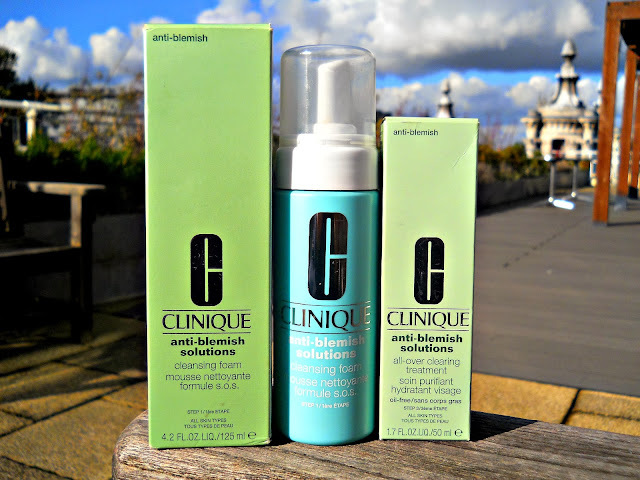 However, the ones with non-natural ingredients seem to work faster and take care of the acne spots which appear which is why i decided to try the Clinique Anti -Blemish range. 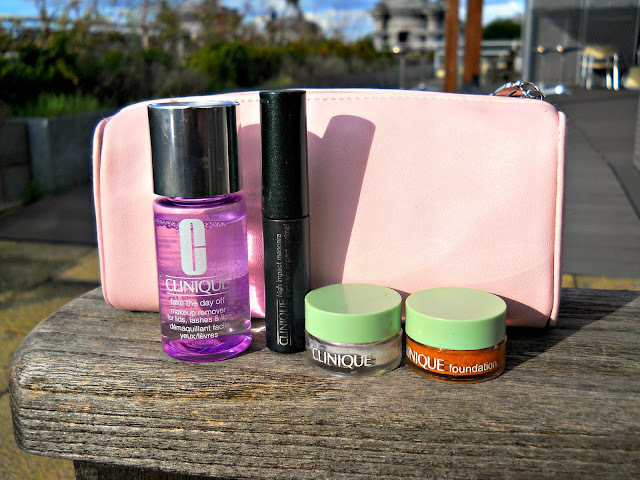 Clinique is synonymous with skin care and i have known them for that from a very young age. I know they also do makeup but i think their skin care range is what makes them a unique brand. 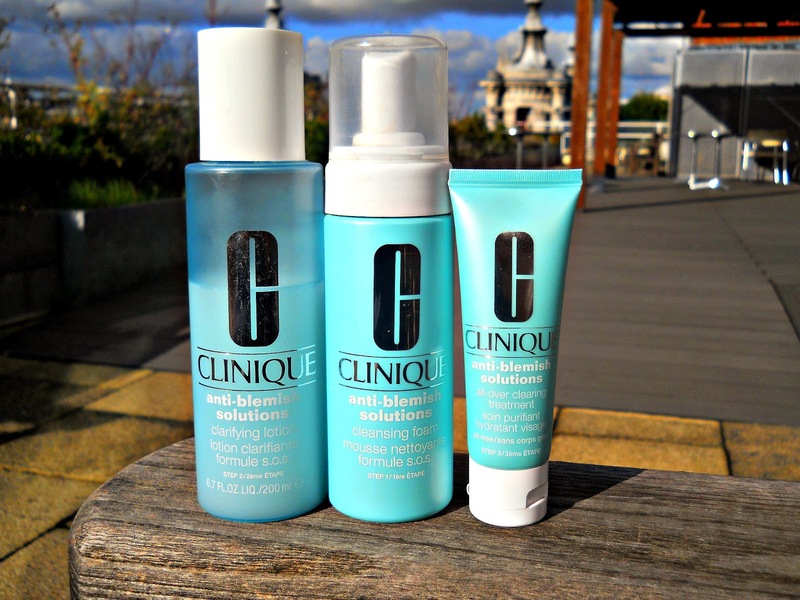 Clinique has launched a couple of revolutionary skin care solutions that cater to different kinds of skin ranging from dry, combination and oily skin as well as acne prone skin. 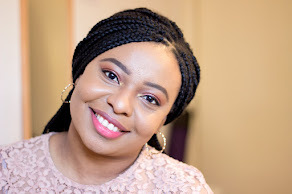 A couple of years back, they launched their 3-Step System Skincare Solutions which comprises of a Cleanser, Toner and a Moisturiser for different skin types (1-4) and this was greeted with mixed reviews in the beauty and blogging world. Most recently, they decided to launch an 3-step system for people who have Acne and blemishes hence the birth of the Anti-Blemish 3-step Solution System. I spied on this a couple of times but I am not sure why i had always been reluctant to try it out..Maybe the price range was a huge deterring factor and the mixed reviews i had read online. Anyways, I got an email from Clinique (i signed up to their newsletter) saying i could receive a free sample of their new Universal Primer and Anti-Blemish foundation and i headed over to John Lewis for one as you all know i find it hard to resist freebies. I ended up getting more than i bargained for as the sales lady was very professional and knew about skin care especially for acne-prone skin. Long story cut short, i left with the samples i came for, the Anti-Blemish 3 Step System (full size) and a couple of freebies( Makeup bag, Eye Makeup Remover, Misting Spray (not photographed-nicked by my sis) and Clinique High Impact Mascara)..let's get started shall we and this is going to be a long review so you may want to find your fave seat and curl up with a hot/cold drink. As always, the packaging is very pristine and professional looking. it comes in the signature light green packaging which houses the product. The Anti-Blemish 3-Step system skin care contains the Clinique Anti-Blemish Cleansing Foam (125 ml), Clarifying Lotion (200 ml) and Clearing Moisturiser (50 ml). I quite like the packaging and i think it is good value for money and it definitely looks good in my bathroom cabinet. I was a bit skeptical about using just a foam for cleansing as I am used to bars or facial washes and i felt a foam will not quite give me the clean feeling I like to have after cleansing. I was pleasantly surprised. 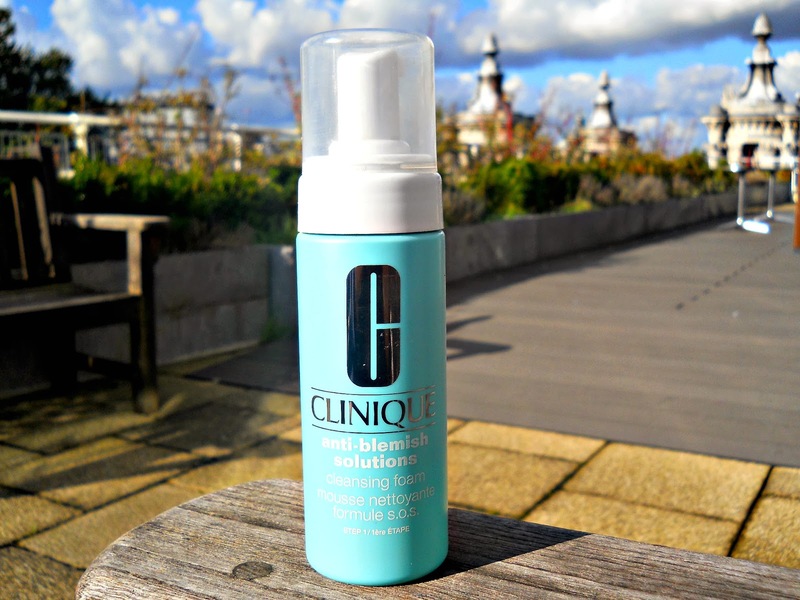 The Clinique website describes it as a mild cleansing foam which helps clear and prevent blemishes by removing dirt, excess oil and unclogs pores while soothing and calming the skin. I am not sure how suitable it, alone, can unclog pores but I am happy to report that it delivers all the other claims. Since it is already a foam, it is already worked up into a lather and feels really soft and smooth on application. Unlike Lancome, Clinique do not include fragrances in their product but i wish they did because this does not smell nice at all. I don't mind no fragrance but strange ones get me a little bit upset. It smells like something medicinal or sterile or like a clinic (no pun intended). 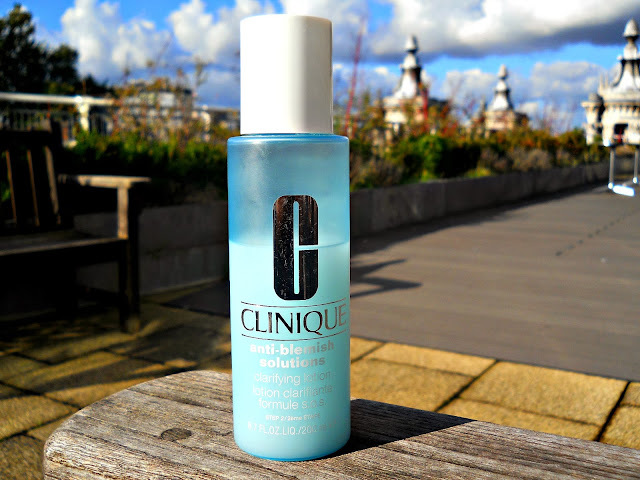 In terms of cleansing, i only use about 2-3 pumps and it does the work. I have since decided to ignore the smell so i try to enjoy working this into my skin and leaving it to for a little while before rinsing off ready for step 2. The Clinique Website describes it as a gentle effective formula which exfoliates to clear dead surface cells and reduces excess oils that lead to breakouts and eliminates shine. I believe it definitely has exfoliating powers on the skin which is really good but i am not sure it should be classified as gentle as it can sting a little due to its Salicylic acid and Alcohol content .Again, this does not smell pleasant at all; It smells strongly of alcohol which goes to say this is an alcohol based toner. Surprisingly, it does not dry the skin out which i think is fantastic. I simply place a cotton pad at the top and tilt the bottle twice to get an adequate amount for my face. It can be a little stingy especially if you have any sore acne. The active ingredient in this is Salicylic Acid which has some residue at the bottom of the bottle when it is at rest which is why it is important to shake the bottle gently to ensure the salicylic acid powder is well mixed with the rest of the product. As advised by the lovely sales woman, i use this with a cotton pad in a uni directional way not rubbing or massaging but just wiping as though i am wiping off something from my face. This clarifying lotion tones and exfoliates the dead skin cells from the surface so you do not need a scrub except your face is really grimey. According to Clinique, this light weight moisturiser has a soothing formula which helps treat existing blemishes, prevents breakouts and controls excess oil while moisturising and hydrating your skin. I can attest to most of these claims especially in controlling oil, moisturising the skin and preventing breakouts. This smells better than the other products but it is not the most pleasant smell as well. I really love how smooth and soft this moisturiser feels against my skin. 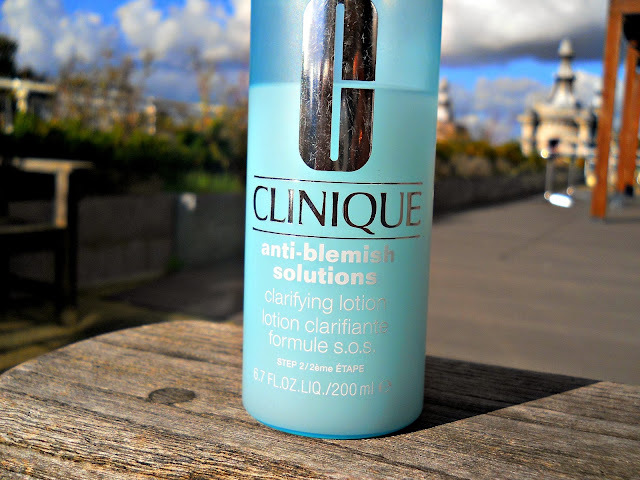 I use it right after the clarifying lotion and i think it is the perfect end for a nice skin care routine. It feels very light on application and it has this wonderful non-greasy feel which means it holds a special place in my heart. I can't over emphasize how important it is to moisturise your skin after cleansing and toning and this is perfect for all skin types. I think it also contains a wee bit of salicylic acid to continue the good work started by its other partners. The amount I paid for this is very complicated. I got a whole lot of discounts and my sister's friend paid the remainder of the amount so I technically paid £30 for all the full size products when i should have paid £51 which i think is a massive saving. I am a very lucky girl and I am so grateful to my sister's friend and the discounts. Of course, you can buy the trial/travel/sample size for £30 which i think is brilliant especially if you want to test it out without breaking the bank. If you are not prepared to spend any of that, then you need to keep your eyes and ears peeled for any discounts from Debenhams, John Lewis, House of Fraser or any big department stores that have a Clinique Counter. Another place to watch is the Clinique Website where you can sign on for their newsletter so you get to up to date information of any discounts, etc. Anyways, I bought this because my friend had used it and swore by it. At the time, I bought it my skin was in complete chaos and I am not sure what caused it. After using this for almost a month, I am happy to report that my skin has been restored to its previous condition. So, I would say it has worked for me in clearing and preventing my chaotic breakouts. I did not get an overnight or outstanding effect but it eventually cleared up the acne. In terms of the blemishes and dark marks, it has not cleared it per se but it has prevented further acne. I don't think it has any effects on the dark pigmentation caused by the acne. Maybe i should try out the Even Better Corrector when i am Rich and Famous as the price ain't a joke. 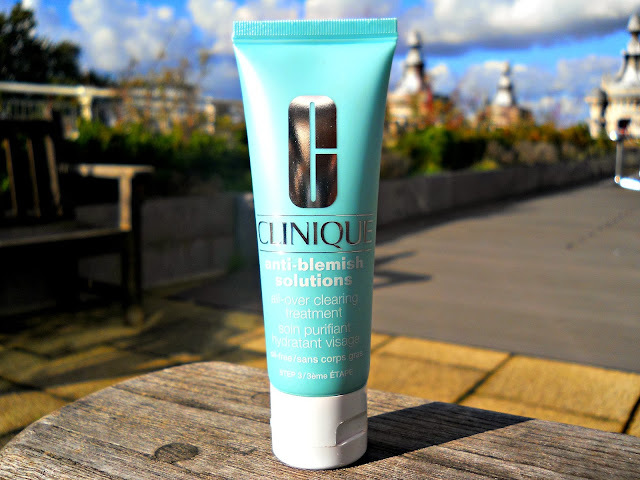 Again, it is very, very important to get a skincare consultation from the Clinique Ladies as they are very good with their advice and it would prevent any unnecessary waste of money. I am not quite sure i would be repurchasing the whole system or range. I do not regret buying this because it has been a good product but I have not seen any outstanding effect which warrants spending £51.50 for the whole set. 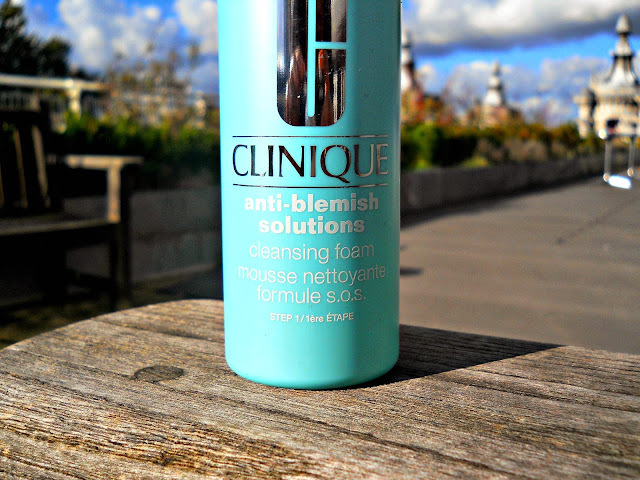 However, I may repurchase the Anti-Blemish Clearing Moisturiser because it is simply what dreams are made of. I am quite cross it only comes in 50 ml and it retails for £18.50 which is pretty steep. The Clarifying Lotion is second on my list if i have another windfall because it is very good and i think it does the work excellently except for its annoying scent/smell. On the whole, I may purchase the travel size of all the products just because it would do the work and would come in handy if i have a sudden break out. Hey there, loved your blog, just followed you on GFC (220), would you mind to follow back? Yeah I agree, Clinque's skin care is what makes them a great brand. Only one of their products has ever worked for me though! Great post!